Our product range includes a wide range of 12"hand operated sealing machine, hand operated pepsi sealing machine and 8"hand sealing machine. We are instrumental in manufacturing and trading Hand Operated Sealing Machine. The offered machine is fabricated in sophisticated production facility for maintaining the set industry norms. This machine is durable, resistant to abrasion, user friendly and compact in size. It is used for sealing aluminum bags and pouches in various industries. This machine is portable and lightweight as well. Size (Sealing length): 8", 12", 16"20"
We are among the celebrated names in the industry for manufacturing and trading Hand Operated Pepsi Sealing Machine to our valued customers. This machine is used for sealing of beverages and provides with ultimate solutions. It is fast, robust in terms of construction, non corrosive and requires low maintenance. This machine is user friendly and can be customized according to the demands of clients. 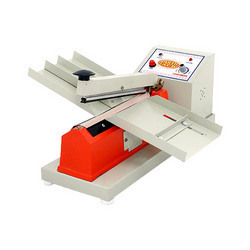 We are instrumental in manufacturing and trading Hand Sealing Machine. The offered machine is fabricated in sophisticated production facility for maintaining the set industry norms. This machine is durable, resistant to abrasion, user friendly and compact in size. It is used for sealing aluminum bags and pouches in various industries. This machine is portable and lightweight as well. Looking for Hand Operated Sealing Machines ?